Stay tuned for upcoming events for Tamasha Festival in near future. Tamasha Festival is the largest Performing Arts Festival of Pakistan. 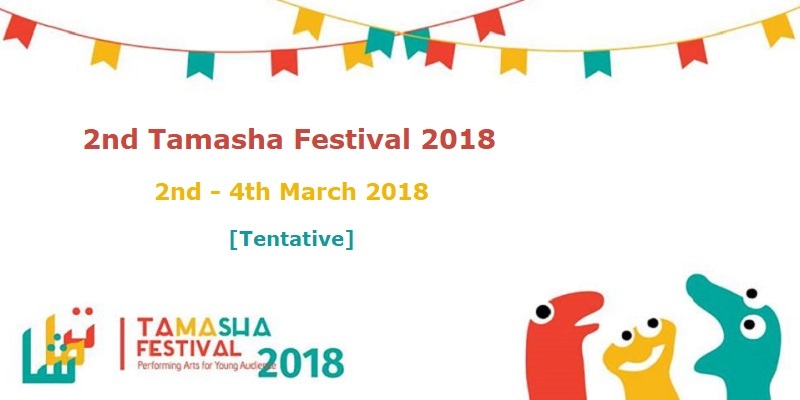 Tamasha Festival 2018 will take place from 2nd to 4th March 2018 [Tentative] at Alhamra Arts Counci, Lahore. It is organized by ASSITEJ Pakistan, The Little Art, Chota Mota Theatre, Maas Foundation and Independent Theatre Pakistan. The inaugural Tamasha Festival 2017 was a 3-day festival which was staged from 7 to 9 April 2017 at Alhamra Art Cencte in Lahore. Tamasha International Performing Arts Festival presents theater performances for young, training workshops from upcoming directors, master workshops from international trainers for local artists and discussion sessions for general public. It is subject to numerous spellbinding performances from International delegates and national artists. The Tamasha Festival hosts international delegates as well as local theatre groups. The three day long Festival includes Theatre, Dance and Music Performances, Storytelling sessions, Panel discussions, Workshops and much more. ASSITEJ Pakistan – National Centre is a chapter of ASSITEJ International working under the rules and regulations of ASSITEJ International and completes the objectives and mission of the international governing body. ASSITEJ has more than 100 national centers around the globe. The National Centre of Pakistan is the official ASSITEJ chapter representing Pakistan. Terms & Conditions : All rights are reserved by organizers. Best Viewed at 1024 x 768 pixels and above. This Page loaded in 0.05288 seconds on Tue, Apr 23, 2019 (21:14).